Food is good, and it’s also personal… and complicated! The food we have to eat, how we get it, and the ways we choose to eat it are ways we interact with food every day. Our food environment shapes how we eat, and is shaped by what we eat. With such an amazing opportunity to enhance our food environment (the new Agriculture Park at Clary Shy! ), this is a perfect time to talk about food. 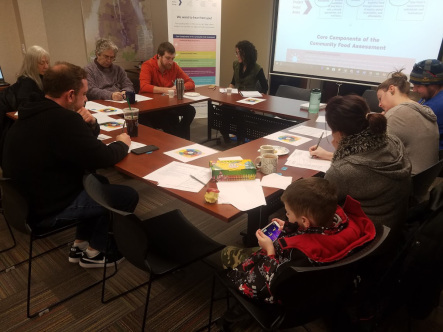 To ensure that the Agriculture Park is a space where everyone is inspired to engage with their food, we are conducting a community food assessment focused on learning more about food in Columbia and its surrounding communities. This project is funded by the Missouri Foundation for Health to help the awesome folks coordinating the Agriculture Park project make informed decisions about creating a park space that is reflective of the most positive possible food environment in Columbia! We are exploring what food is available through an inventory of food items in grocery stores, convenience stores, food pantries, farmers markets, and restaurants around town. We are also learning about access to all types of food by taking a look at locations in our neighborhoods, transportation, wheelchair accessibility, and food culture. With all this variety of food to eat, we are investigating how everyone is utilizing food by investigating diet and nutrition priorities, cooking and gardening habits, and selection of food sources. If you haven’t yet heard, focus groups are currently being conducted and our community health survey is open through March 15th . Anyone who buys and/or eats food in Columbia is welcome and encouraged to participate in both! We appreciate your willingness to help us honor and amplify perspectives from diverse community groups in Columbia. Your unique voice and contribution of time and ideas is of great value to this effort! Find out more, take the survey, or sign up for a focus group at www.buildthistown.org/cfa!